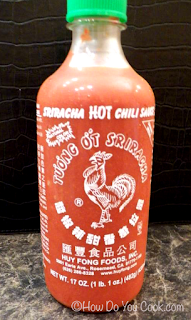 I love to use Sriracha sauce when cooking oriental dishes such as Hot and Sour Soup. We also use this in our Baked Buffalo Chicken Wings, and General Tso's Chicken. If you are not familiar with this product, here is a little information on this spicy sauce. Sriracha is made from sun ripened chilies which are ground into a smooth paste along with lots of fresh garlic. It's excellent in soups and sauces, or on pizza, hot dogs, hamburgers, or anything else to give it a delicious, spicy taste. It's amazing on deviled eggs! Look for this sauce in the Oriental section of your local grocery.